Today I am showing you the last of the four AEngland Legends I purchased, AEngland Ascalon. Like the other three, Ascalon is a dream to apply. I only needed two coats of this beauty for full coverage. The AEngland description of Ascalon is pretty intense, so I'm going to repost it here: "Forged by magic and guided by our hero's sainted hand, the steely grey of his spire is alive with a swirling heart of lavender fire." In other words, Ascalon is a steely grey holo with a pinky lavender duochrome flash. When I put Ascalon on and looked at it indoors, I thought "pretty". When I walked outside to take pictures, I thought "JHFWENAADJKKJKIOJNEYU!!!!!!!!" If you own this and you haven't ever viewed it in direct sunlight, go do it NOW!!!! If you don't own this, order it immediately and wear it to the next outdoor event you attend on a sunny day. You will die when you see it in the sun. OMG. 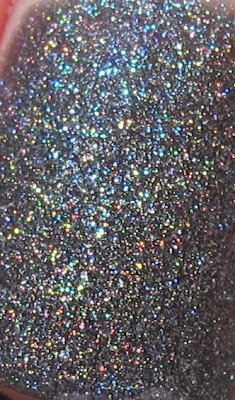 Intense holographic effect PLUS duochrome!! I just passed out. Unfortunately, the duochrome in this lovely polish photographs as a kind of cloudy effect on the nail. You can see what I mean in the picture below. It looks like there is a cloudy film on the polish. In real life, I saw a lot of strong lavender/pink flash when I took this picture. Ok, I'm back. 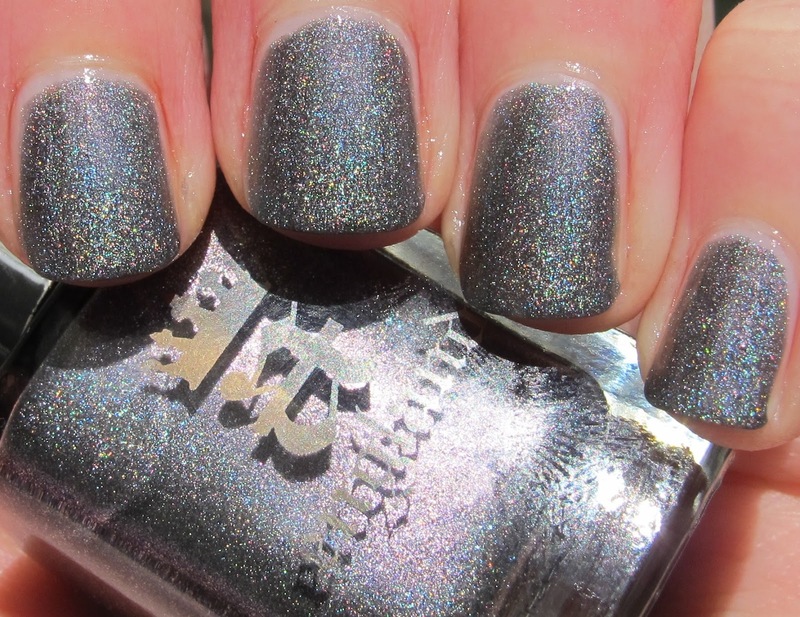 Ascalon is available on AEngland's website, I do suggest you purchase it and wear it outdoors in the sun. That is all.